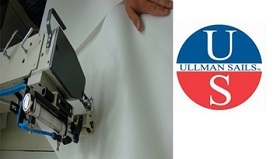 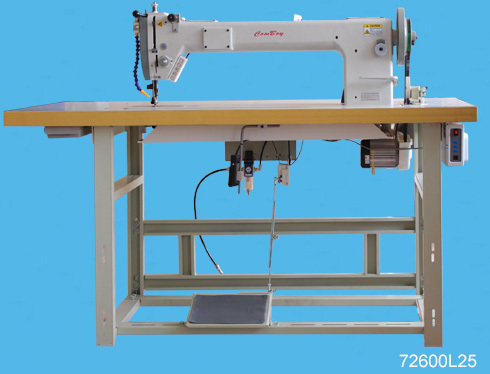 Features: This specialized sail making machine gives large working space underarm eliminates the effort and time needed to fold and roll wide sections of sailcloth and cover fabrics during sewing operations; This machine is recognized as the ultimate sail maker sewing machine currently available, it is capable of powering its needle through 20mm of Dacron, Kevlar, Webbing, Canvas and leather (with real needle cooler); Extremely strong needle penetration force, can easily sew sturdy webbing reinforcement and extra heavy sail corner patches; The large shuttle hook and bobbin capacity reduces the number of bobbin changes and offer high efficiency in sewing sails, tents and tarpaulins, using extra thick thread up to size V207; Easy to change cam for straight stitch, 1-step (2-points), 2-step (3-points), 3-step (4-points) zigzag, cover all demands of modern sail making industry; Standard supplied with heavy duty top and bottom feed puller, which is perfect for sail makers; This class zigzag sewing machine can be made with different arm length; This robust and reliable sail sewing machine is designed for mass-production sail making business (similar with Durkopp Adler 366-76-12-HM). 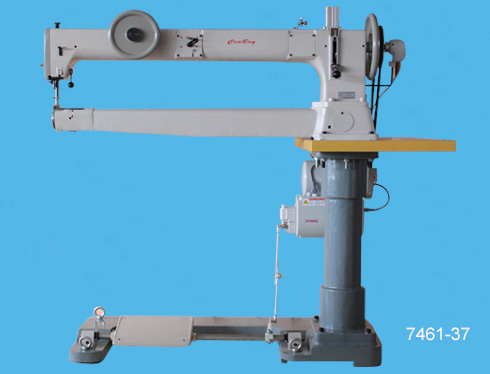 Feature: The sewing machine cylinder shaped arm has been extended (complete casting, not a cut and piece extended arm) to give approximately 960mm clearance, which is very useful when sewing larger items, for example: golf bags, luggage bags, industrial boots, covers etc. 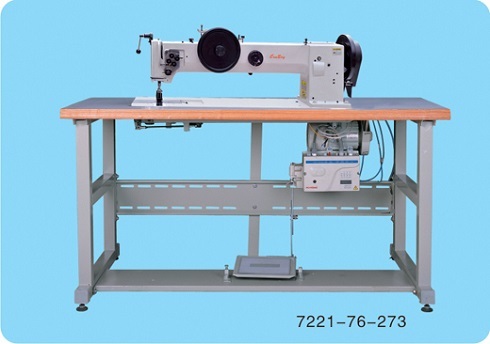 ; The special extra long feed up the arm cylinder machine (7411RL-37) is suited to sewing for example: large tubular shapes, golf bags, luggage bags, tents, sails, parachutes, umbrellas, fishing gear, cushions etc. 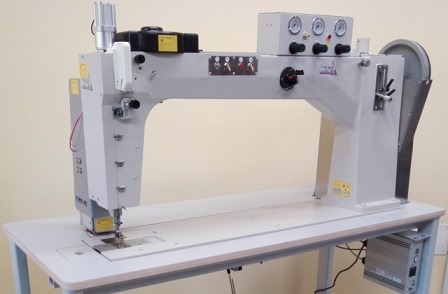 ; It is fitted with an extra large shuttle hook assembly (204 type) for use with heavy weight & extra heavy weight materials and extra thick threads; The presser foot has an extra high lift and can go up to 23mm, allowing for a large range of heavy & extra heavy weight material to be used. 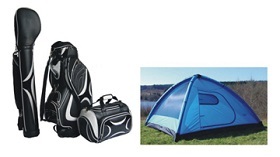 Application: golf bags, luggage bag, filter bags, fishing gear, industrial boots, industrial safety products, tents, awnings, tripod case, punching bags, boxing bags, sails, parachutes, umbrellas, cushions, and other products where transverse (sideways) stitching is necessary. 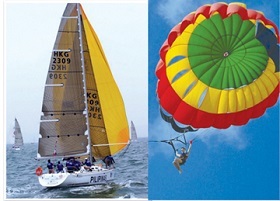 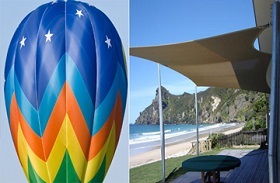 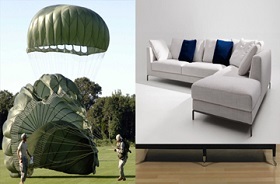 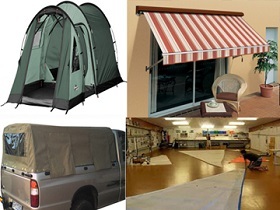 Applications: marquees, tents, shade sails, parachutes, upholstery panels, car trimmings, inflatable products, Big Bag and container bag, bouncy castles, awnings, gliders, hot air balloons, pool covers, lorry curtain sidings, top stitching leather etc. 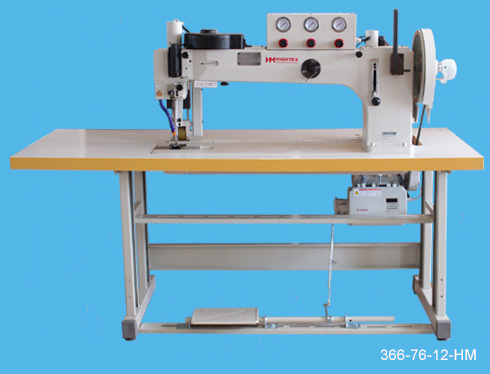 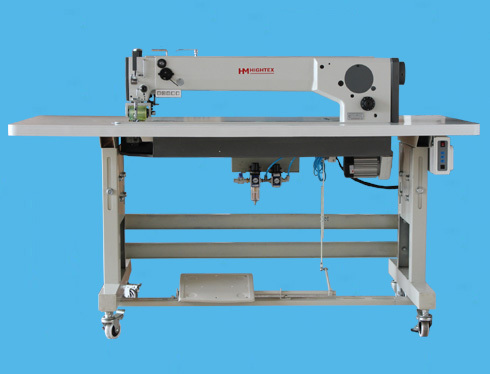 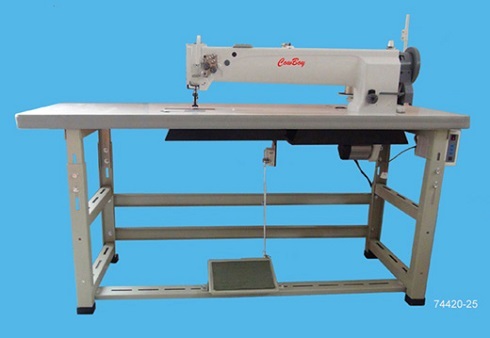 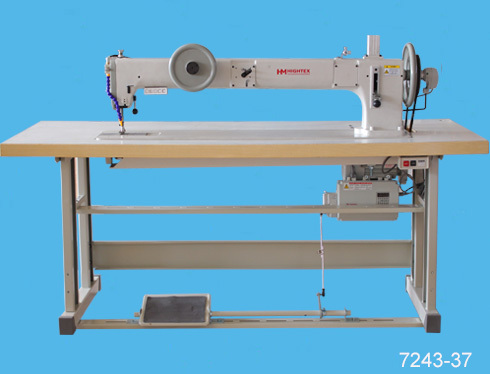 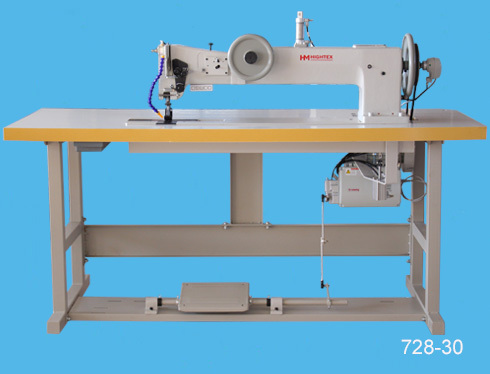 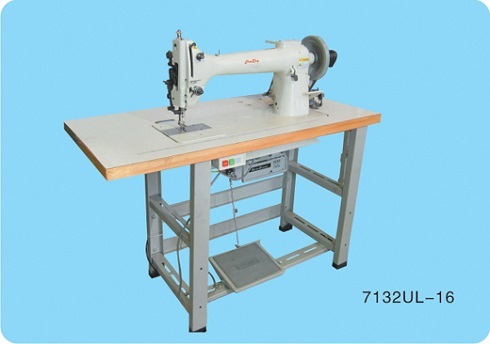 Features: Equipped with one of largest horizontal axis hook and extra large capacity bobbin for use with heavy weight materials & thick sewing thread; Heavy duty upper (alternating presser feet) and lower feeding mechanism ensures even feeding of materials being sewn; This machine has a reverse feed mechanism for backtacking and locking in the beginning and ending seams; The machine will stitch to a combined compressed capacity of up to 5/8" of an inch of upholstery fabric or leather and has a presser foot lift up to 7/8"; Ideal updated replacement for the old Singer 132K series; With strong servo motor (Powerful + Quiet + Accurate Speed Control, different from so call "Energy Saving Servo Motor"or "Power Saving Servo Motor" in the market. 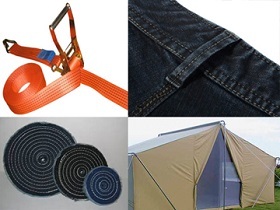 Applications: saddles, harnesses, horse rugs, carpets, polyester lifting slings & cargo lashing strap (Ratchet Tie Down), nets, webbing, tack, belts, sheets, spanzet, safety belts, buffing wheels, Big Bag, FIBC, container bags, jeans, sails, luggage, traveling bags, tents, awnings, seats, car upholstery, boat trimmer, bouncy castle, boat covers, shoes, footwear and general canvas work etc.